3 bedroom 2 bath plus office. 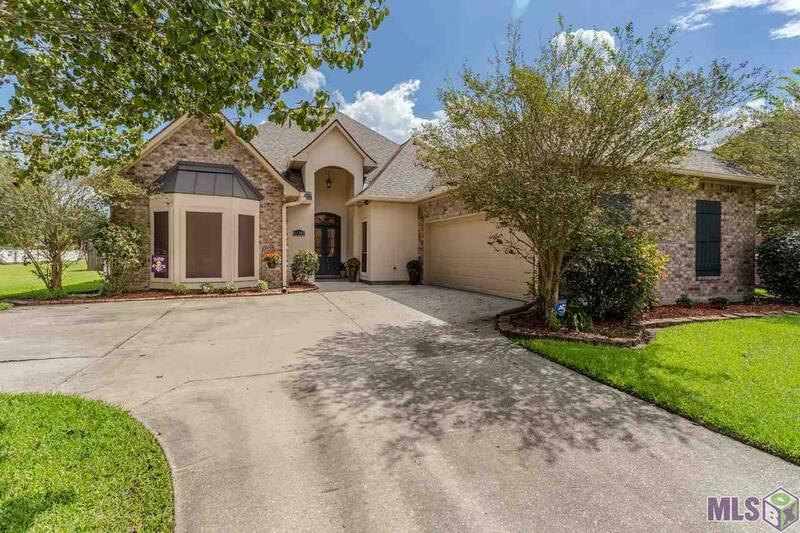 This home in Lakes at Ascension is in pristine condition, conveniently located near I-10, in the popular Dutchtown School District, and ready for new owners! You are greeted by a spacious foyer, followed by the living room with crown molding, hardwood flooring, and double french doors leading out to the impressive 23 x 18 covered back patio. The kitchen has a huge quartz top island, new quiet stainless dishwasher, and plenty of storage; furthermore, it opens up to a dining area that can accommodate a large table and hutch. Laundry room features a utility sink and half bath near the garage entry. No carpet here, the master and additional rooms all have hardwood floors and neutral paint colors. The master bath features a custom tiled shower with a heavy seamless door, dual vanities, and soaking tub, while the additional bathroom has Corona Marble top vanity. The spacious back yard is nicely landscaped and the roof was recently replaced in 2015. Community pond with beautiful views & fishing. 6x19â3 storage room offers enough space for lawn equipment, tools, and workspace. Subdivision ski lake offers a close place to have fun in the sun! (membership required) Refrigerator Remains. Seller offering home warranty.